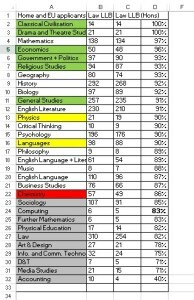 Home » Blog » General » What A-Level subjects do Russell Group universities prefer? One of the coalition government’s many league table innovations has been a new measure: the Key Stage 5 “facilitating subjects” column. It records how many pupils in each school get two As and a B in A-level Maths, English, physics, biology, chemistry, history, geography, computing and languages. The government has chosen this list because these subjects echo those mentioned in the Russell Group’s “Informed Choices” booklets. RG universities ‘prefer’ students to take two of these subjects. 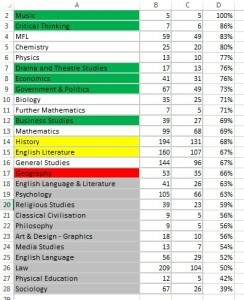 So, the theory goes, schools that press students to take these subjects are more likely to get university places. The government measure has been widely criticised. They are described as elitist, or non-creative, or boring. But the real problem with this scheme is much simpler: there is no evidence (beyond stated prejudice) to support the claim that they actually do ‘facilitate’ entry to Russell Group universities. Even though the Russell Group secretariat which produced this booklet claims that there is a preference, back in March I used data from Oxford to show that no systematic preference for facilitating subjects was found for Maths or PPE applicants. In fact, several non-facilitating subjects appeared to make participants more successful in their applications than the one’s the government were now pushing schools & college to encourage. Greens gave me the data. Yellows gave me partial data (so not included here). Blacks refused. 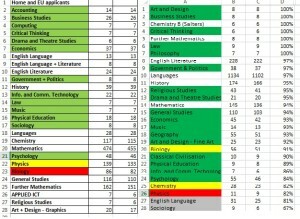 To stay within parameters of FOI costs I asked just for the number of people applying with each subject, and what proportion got in. Sadly, the figures do not allow me to see combination effects. This is annoying as they probably exist (as discussed here) but it was all I could get. It might be that if you take 2 facilitating subjects then what you do for the third doesn’t actually matter. But we can still say something: the league table measure requires 3 facilitating subjects. The only reason for this can be because the government thinks there is, therefore, no such combination effect. It’s three subjects or bust. 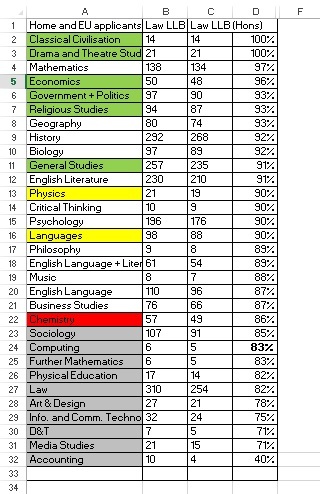 Subjects with success rates lower than any facilitating/Ebacc subject are in grey. 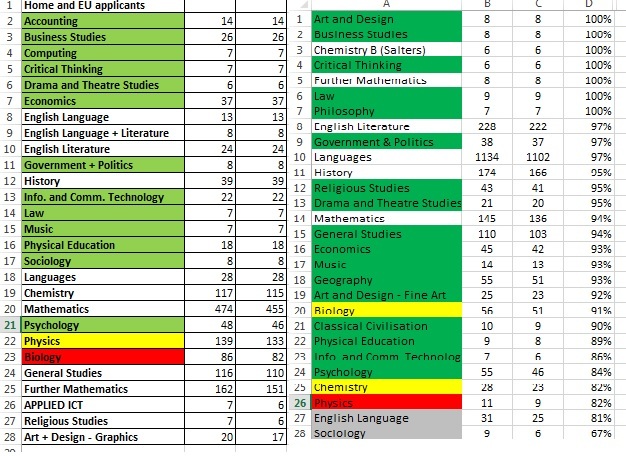 Subjects with success rates higher than at least two facilitating/EBacc subjects are in green. 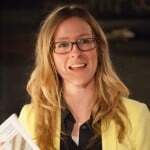 So does the ‘facilitating subject’ theory hold up? As expected: No. At least two non-facilitating subjects had higher success rates than the majority of facilitating subjects in every course. In two cases, more than 12 other subjects had a higher % success rate than did applicants with ‘facilitating’ subjects. Isn’t it still safe to do three Facilitating subjects? Actually, no. Economics A-Level students are consistently accepted at one of the highest rates, beating out History, English and Modern Foreign Languages across all courses except Law at Bristol and Medicine at Exeter, where it comes within a 2% success rate of both. Drama appears high on the list at all three universities. This was a revelation to me. Remember, this is law at three Russell Group universities. And yet, drama, which no-one has ever mentioned to me as a ‘rigorous’ or ‘preferred’ subject actually seems quite important for law. When you think about it, this should not be a shock. Law has an enormous amount of performance to it. But if you follow the league table thinking…. No-one would ever advise a student of theirs who wants to do law at a Russell Group university to study drama. Instead you might pick physics, or chemistry, or one of the other subjects which – as it stands – look to have a much lower success rate (around the 60% mark). Some subjects derided by the Coalition government do appear at the bottom of the tables a lot. Sociology almost always appear below facilitating subjects, accounting and media studies are also there lots too. However, some of the other allegedly ‘soft’ subjects are more sporadic. And while 49 applicants may be a small number, it is not as small as the number taking English Literature, or Languages, or History, so I’m unwilling to write this off as a fluke. It also suggests that medicine admissions tutors believe it is a good indicator of suitability for their course and historians not. 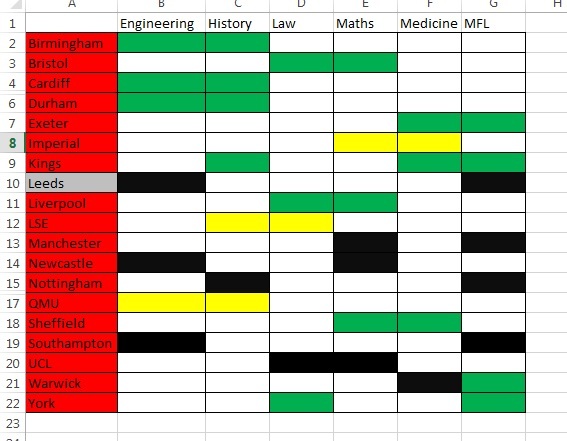 That said, history had music in the top 6 subjects across each of the three courses surveyed (Positions 1, 5 & 6). 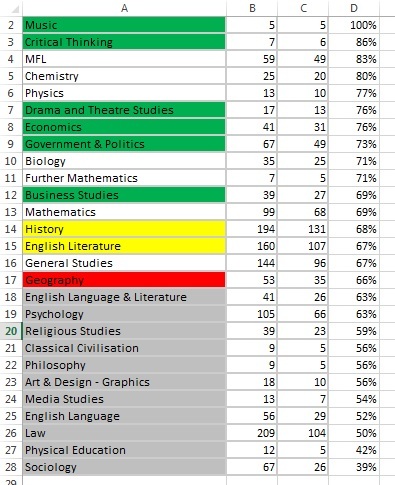 At Durham, ”film studies” had the third highest success rate for history. 4. 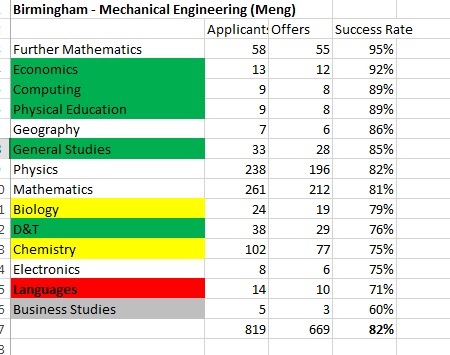 If you apply to some degree subjects you’re basically guaranteed an offer regardless of your A-Level choices! 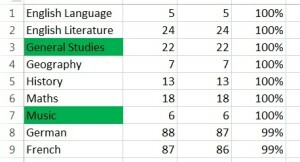 One unexpected finding was the difference in success rates between the courses. 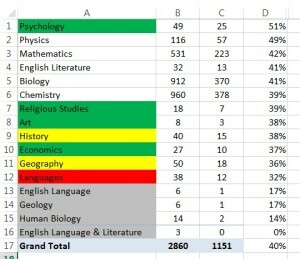 History at Durham, for example, had no subject with a success rate higher than 44 per cent. So many people apply that even with the subject most likely to aid approval, you’re still getting a ‘yes’ less than half the time. However below are the acceptance rates for MFL at Exeter & Warwick, and maths at Liverpool. All RG courses, but with almost no-one turned away regardless of subjects. 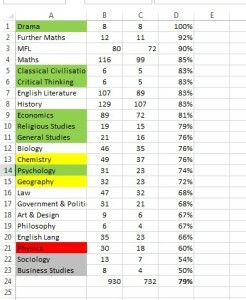 In fact, for both Exeter and Liverpool we again see this pattern of the sciences having among the lowest success rates. The “3 facilitating subjects” government measure is dangerous. It sets up a list of seven subjects as being ‘facilitators’ when the reality is much more complex. Preferences differ across subject, across university, and will depend on the student. Economics and drama seem a pretty good bet if you want to do an “essay” subject at university. But even subjects as diverse as accounting, art and design, and psychology have topped the success charts. On the down side, sociology and media studies do seem to appear at the far bottom of the list more often than they appear in the middle (and neither ever makes it near the top). 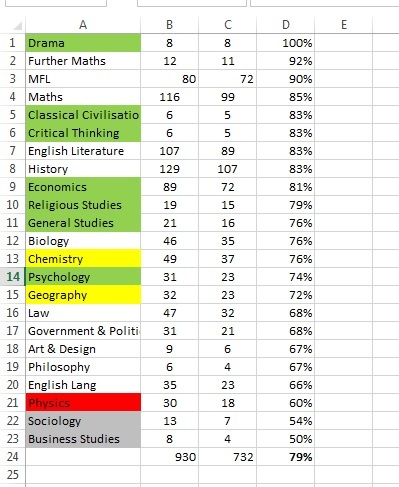 Which isn’t to say that the subjects aren’t worthwhile, nor that doing them means you can’t get in – remember, even when near the bottom, it is still usually the case that 20-40% of people with these subjects still got offers. But what really matters is that the universities need to put the research where their mouths are. Much of this data was back to me in a matter of days from the universities. It took some manipulation to get to this point, but not vast amounts, and it is limited because of data protection implications. The universities could – and should! – be doing this research themselves. Teachers want to advise our students as best as possible. We cannot do it with misinformation. It is unacceptable that “the Russell Group” and the government are promoting these subjects as being preferred when it might not be true. It’s time for them to come clean, and take this daft ‘3 facc subject measure’ out of the table, before it does harm. Fascinating, especially the Drama data. A very good over view of rarely spoken subject. Well done.